In this article I introduce a new analysis on the content of the interview to the President of Ecuador Rafael Correa published by The Guardian. The analysis includes new transcription-details of texts not reviewed in the first part of this series published in my post What Correa really said about Assange and the safe-conduct to Snowden. The misleading Guardian article on negative positions ascribed to Ecuador towards Mr Assange and Mr Snowden continues been used as source in international dispatches. In this article I introduce a new analysis on the content of the interview to the President of Ecuador Rafael Correa published by The Guardian. The analysis includes new transcription-details of texts not reviewed in the first part of this series published in my post What Correa really said about Assange and the safe-conduct to Snowden. 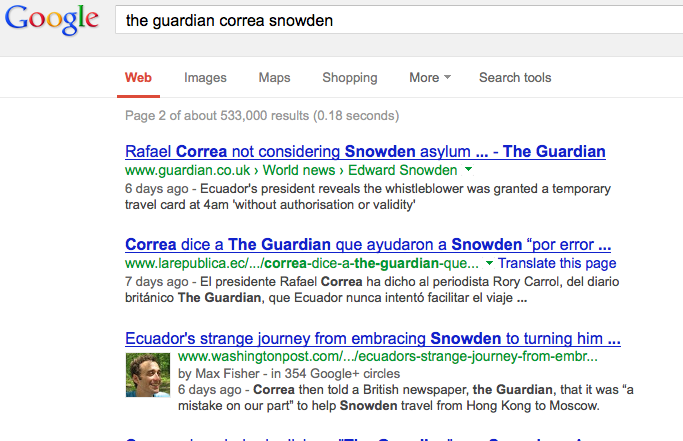 In the beginning I did not care much in finding the rationale of that new Guardian story focusing on President Correa and Mr Assange, and partly the Edward Snowden asylum issue. Or better put it, reflecting on whether there are other or new aspects in this disinformation campaign, besides items already analysed in previous posts in Professors blog about the Guardian; some of them published already in 2011. We at the Professors blogg were already quite familiar with this classical, periodical Guardian-number in these regards; namely, the smearing against the organization WikiLeaks and in particular against its founder Mr Julian Assange – and also the censorship or filtering used in the Guardian against articles published in these columns. A revealing background about the Guardian campaigns against Mr Julian Assange and WikiLeaks can be found in this article (Click on the tweeter below) at the MartaMitchelEffect site. However, the deeper I dig in the interview by Rory Carroll to President Correa, and the wider I found the echo of the original Guardian article amongst the international MSM, the need of new explanations emerge. This, for several reasons. This time the anti-Assange campaign implicates the situation of whistle-blower Edward Snowden, whose revelations constitute in U.S-ally England, news beyond the domestic and international spying of the U.S.; Novel disclosures in conjunction with Mr Snowden regarding U.K.’s own spying on their peoples, poses an imperative to the journalist role of a MSM-establishment to which the Guardian is an important part of. Secondly, after the publication in the Guardian of “Rafael Correa says we helped Snowden by mistake” we are confronting here a similar “media” phenomenon than the previously observed in Swedish settings. The deceptive “information” suggesting that Ecuador is in process of abandoning Mr Julian Assange and Mr Edward Snowden, was first published in the Guardian. But rapidly converted in a widespread international media campaign -- using the Guardian as source. This was exactly the same design used in the Swedish anti-WikiLeaks media campaign of February 2012, using biased “information” (also ungrounded) first published in the tabloid Expressen, and which was successively quoted as source in multiple MSM dispatches of the campaign-period (see Anatomy of an untruthful scoop: Sweden’s psychological warfare against WikiLeaks, and the political case VS Julian Assange. Part One). The difference being here that the echo-chamber of the Guardian deception has been international. I gave as an example of this the Washington Post article entitled “Ecuador’s strange journey from embracing Snowden to turning him away” and that used the above mentioned Guardian reportage as a source. (See the previous post in this series). But the illustrations spreading these falsehoods - all of them using the Guardian as the source - are multiple, as seen in some examples here below. Thirdly, the media manoeuvre is clearly directed to embarrass not only the relationships between Ecuador and his political-asylum guest at the embassy in London, but also this campaign aims to hurt the political credit of the Ecuador government. In these terms, Ecuador is nowadays presented in some international media as being in contrast with other Latin American governments such as Venezuela, Nicaragua or Bolivia. The international MSM is finally - thanks to the Guardian - spreading away a false portrait of President Correa as giving up to US pressures ("Correa caves”, as for instance is referred to in this dispatch). Why would the British MSM campaign/smear against the Ecuadorian government? For sooner or later, when/if the normal diplomatic pursues between Ecuador and the U.K. in trying to solve the “juridical” impasse at the London Embassy, then the confrontation will be politically open. In this confrontation will participate on the Ecuador’s side a variety of important of Latin America. Amongst these countries Argentina, and their reclaim of the Falkland Islands will be surely an item. [See “III. Five political scenarios that can break the deadlock: The Latin-American situation” in Sweden’s Prestige Deadlocks Case Assange]. The shortest road of disarming such eventuality is apparently to discredit the Ecuadorian government, and search for their isolation. This explain the fallaciously picture that the U.K. media, as well as in Sweden and other pro-U.S. countries have tried to project about “differences” between known ALMA countries such as Nicaragua, Bolivia, Cuba and Venezuela on one side, and Ecuador on the other side referring the issue of asylum for Edward Snowden. At the same time that the press publicizes the asylum possibilities in those countries, they falsely print that Ecuador “is not considering and will not consider asylum for Snowden”. Which is totally false, as it is proven here through the (unpublished) facts on the interview of president Correa done by the Guardian. My interest, or curiosity, to go further in analysing this interview was triggered by the peculiar fashion Rory had in his questioning to Correa; the unusual, markedly leading formulations; the extreme persistence of coming back to the same subject when he did not get the answer, those replies a priory constructed in his questioning. For instance, “Is it not true that Assange had abused ‘a little’ the confidence of the Ecuador government”? Rory Carroll whispers in a soft, not-confronting tone, “inviting” for agreement as one comment said. Then, in spite all the above, journalist Rory Carroll insisted later with the same item, this time trying to find support in what some Ecuadorian Ambassador, he said, had expressed about Assange’s declarations. But Correa at that point manifests he had another interpretation than the version given by the journalist . So, apparently the interview did collapse. What is left to do for the Guardian? It is said that Einstein joked about “truth” in unscientific reports by repeating, “If the facts do not sustain your hypothesis, then change the facts”. And it was that type of pseudoscience, here as journalistic alchemy, what converted the Guardian’s hypothesis of work referring Assange, into “facts” reflected in published conclusions that a President Correa never uttered in reality. "Entonces, no es que hemos negado el salvo conducto, si no ese salvoconducto no tiene ninguna validez.” [Then, it is not that we have negated (denied) the safe-conduct, instead it is, that safe-conduct has no validity]"
My comment: What President Correa possibly referred above with “instead that that safe-conduct has no validity” is stating a matter of a fact. For the safeconduct was issued for the purpose of travelling between Hong Kong and Moscow; not for leaving Moscow to another country. And this is confirmed in the letter sent by Edward Snowden to the Ecuadorian Government, when he is thanking Ecuador precisely for that safe-conduct which made possible his transit to Moscow. Si Snowden va a nuestra embajada, pues, lo consideraremos (para el asilo). [If Snowden get to our embassy, then, we shall consider him"
I too have pondered why The Guardian plays this despicable role, when they are clearly capable of excellent journalism when it suits them. It seems clear that ultimately The Guardian serves UK Establishment interests, and no doubt MI5 regularly discuss "matters of importance" with EIC Alan Rusbridger. This recommended link has some thought-provoking discussion.